Goblet cells, which contribute to mucosal defense and repair in the intestinal epithelium, are depleted in human and rodent colitis. The Notch signal pathway regulates the differentiation of intestinal stem cells into epithelial cells and inhibits the differentiation of secretory lineages, including goblet cells. The aim of our study was to clarify whether the blocking of the Notch pathway at an early stage of colitis would preserve goblet cells and facilitate the healing process in dextran sulfate sodium (DSS)-induced colitis in mice. DSS was orally administered to C57/BL6 mice for 7 days, and dibenzazepine (DBZ), a Notch pathway blocker, was administered for 5 consecutive days, beginning on the first day of DSS treatment. Colonic mucosal inflammation was evaluated clinically, biochemically, and histologically. The expression of the goblet cell-associated genes Math1 and MUC2 and proinflammatory cytokines was evaluated by real-time reverse-transcriptase-PCR, with the expression of Math1 and MUC2 also visualized by immunohistochemical examination. The administration of DBZ at 4 μmol/kg significantly reduced the severity of the colitis. Compared with the DSS only-treated intestine, the number of goblet cells was relatively sustained, and the expression of Math1 and MUC2 was also elevated in the DSS/DBZ-treated intestine. DBZ treatment suppressed the mRNA levels for interleukin-1β and -6, and matrix metalloproteinases-3 and -9 in the DSS-treated intestine. 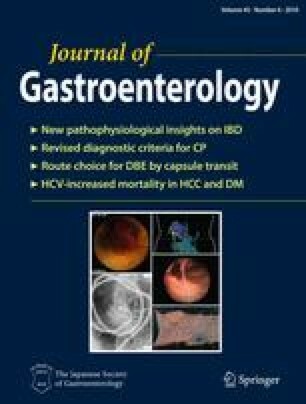 Early-stage blocking of Notch signaling may ameliorate acute DSS colitis by preventing reduction in the number of goblet cells. The online version of this article (doi: 10.1007/s00535-010-0210-z) contains supplementary material, which is available to authorized users. We are grateful to Dr. S. Kokura (Kyoto Prefectural University of Medicine, Kyoto, Japan) for helpful discussion. We also thank Dr. W. T. V. Germeraad (University Hospital Maastricht, Maastricht, The Netherlands) for his critical reading of the manuscript. This study was supported by a grant-in-aid of the Japanese Ministry of Education, Culture, Sports, Science and Technology.